We are so pleased to announce that our new website is up and running. 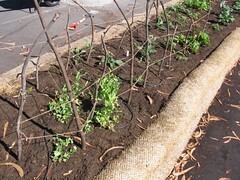 We are officially moving all of our blog activity to our new www.urbansprouts.org site. Please check it out and bookmark our new page. Oxalis Challenge at Ida B.
I recently learned from my students that oxalis, an invasive and aggressive weed for many San Francisco gardeners, is also called sourgrass, whose flower stalk can actually be chewed. Although oxalis has another beneficial function, that is, to prevent soil erosion on slopes, I can't help but feel that every time I'm up at one of my schools, it's a renewed battle between oxalis and gardener. Last week, I issued a challenge to my students at Ida B. 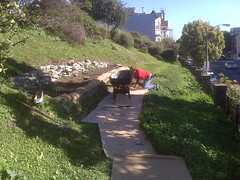 Wells to pull out as much oxalis as they could from our two main beds, which would be documented as before and after pictures on this blog. 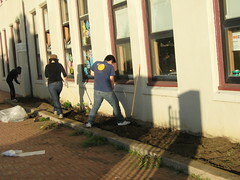 Although some students went right to work, others required much more coaxing; many students seem to have an inherent dislike of weeding, even if it's just the patch in front of them. 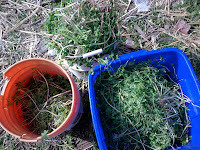 At the end of class and after three huge piles of oxalis, it still looked like we barely made a dent in the ratio of oxalis to vegetables. 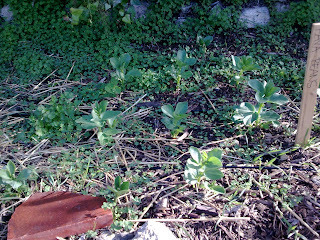 Note to self - next time, to prevent oxalis takeovers, try mulching early before the rains start. I am very excited to bring to you a glimpse of a day in our gardens. Thanks to our new Flip cameras, you can see Urban Sprouts in action preparing freshly harvested collards into delicious, simple, gourmet snacks! Students at both Martin Luther King middle school and International Studies Academy have gotten excited about sharing their perspective of the garden to the community and each other. In the near future I hope to use the Flip camera as a medium of communication between the two schools. At Urban Sprouts, we want to connect students to local produce, whether it's food from the school garden, persimmons and lemons from someone's backyard, or fresh finds from the farmer's market. 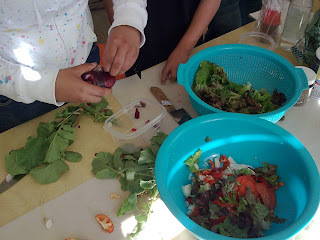 At Aptos Middle School, the lettuce, arugula, and radish from our school garden were ready to be harvested and tossed into a salad. 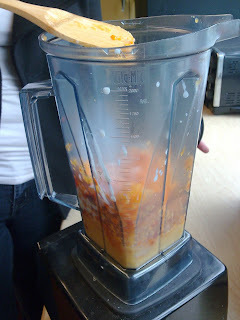 Students washed, chopped, and combined local fruits and vegetables with a sesame salad dressing and a persimmon vinagrette. Although some students were more interested in the cooking than in the eating, it was a first step towards creating healthy (and colorful) dishes using many local ingredients. Additionally, students at Ida B. 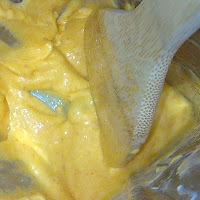 Wells Continuation High School learned how to whip up persimmon ice cream using only five ingredients (lemon, vanilla, sugar, buttermilk, and persimmons), and without a fancy ice cream maker. Thank you, Ms. Bressack, for donating the delicious persimmons from your backyard! 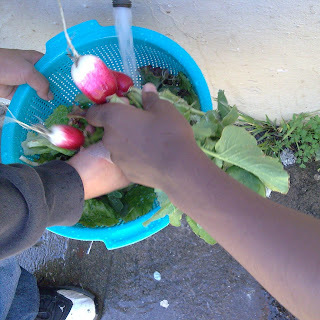 Help grow the school gardens movement! We are looking for members to join our Outreach Committee. These individuals will work alongside our staff to represent Urban Sprouts at partner school events, community fairs, farmers markets, and other city-wide events. We are hosting our first garden work party at our newest site, Log Cabin Ranch. As the garden is located in La Honda (about 45 miles south of San Francisco) we will be organizing carpools for all participants. We will be contacting those attending by December 10th to arrange rides. Please note this is a San Francisco Juvenile Probation Department Facility and participants in the work day will need to be at least 21 years of age and bring a photo id. Last week was a busy week in the gardens as we hosted 3 large group events. Employees and students from Wells Fargo, Haas School of Business, and Blueprint Research & Design performed almost 100 hours of volunteer labor as we built worm bins and compost bins, dug new beds, and completed some general garden work. This was a fantastic start to our new composting initiative as we are on track to build new compost bins, worm bins, and compost sifters in all 7 of our sites in the next few months. Thank you so much for your time and energy, it's always so great to welcome new folks into the gardens. Thank you, Yahoo! for a HUGE boost to our composting efforts! Read on Yahoo! 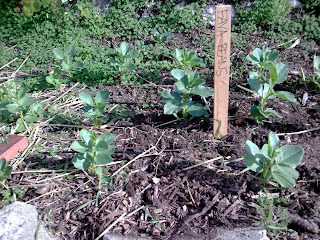 's blog about this great compost project they funded for us, as part of their Purple Acts of Kindness. Salesforce.com supports nonprofits by providing CRM licenses for products such as contact management software, call center software, custom application development. Get your own t-shirt or tote bag and view all our styles. Visit our store on Cafe Press! This is a Flickr badge showing public photos from abbyrosenheck. Make your own badge here. 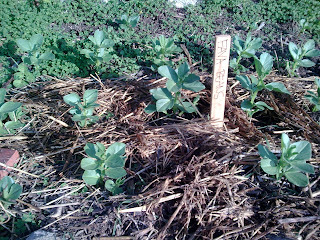 Get the Urban Sprouts School Gardens widget and many other great free widgets at Widgetbox! For important nutrition information visit www.cachampionsforchange.net. For food stamp information, call 877-847-3663. Partially funded by the USDA Supplemental Nutrition Assistance Program, an equal opportunity provider and employer.